Let me just start out by saying that I think wild mushrooms are delicious, but had absolutely no clue how to collect them. Every mushroom seemed like a poison mushroom to me and the thought of being able to identify and collect wild mushrooms without putting my own life at risk seemed crazy. So, when I saw the listing for the Quinault Rain Forest Mushroom Festival it seemed like the perfect reason to get away for the weekend and learn something magical and delicious. What a great way to spend the weekend. This was the 8th year of the Quinault Mushroom Festival, held at the Lake Quinault Lodge. The weather was the nicest anyone had ever seen. Clear blue skies in the day. Starry nights. Dry enough for a bon-fire by the lake. No cold wet breeze; just really really pleasant autumn days and nights--the kind we rarely ever see in the Pacific Northwest. Not only was the weather perfect, but this also was the most popular year ever. Mike, the festival host, told me that they usually get around 60 or so people at the festival. This year was over 100. That made for a couple crowded workshops, but not in a bad way. Sitting in a room full of people who are there because they want to learn about mushrooms and care about the environment that mushrooming depends on was a really great experience. Most people were older. Many were retired, I would guess. And everyone was there to have a mellow good time. No manic harvesters. No dread-locked, dirt mongering forest hippies. No college kids looking for magic mushrooms. Everyone was considerate and good humored and really easy to get along with. And the guides were really helpful. They understood they were taking a bunch of noobs out into the woods and no question was too simple. The giant living mushroom table. This thing was amazing. Every kind of mushroom you could imagine was there. The table was about 20 feet long and had many many trays of mushrooms on it. All the mushrooms were labeled. Red meant poisonous. Green meant edible. Yellow meant...well, take your chances. They were all alive and had different stages of growth. This was set up the entire time, right in the middle of the conference hall, so we could ask questions and look around as much as we wanted. This table is set up every year and is really remarkable. At the end they let us pick any mushroom we wanted. 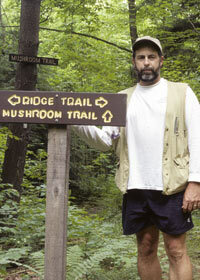 Dr. Turdell teaches at the University of Washington and is a leading expert on mushrooms. Although I missed the first night's class, the second day's class on mushroom identification was really interesting and helpful. One particularly fun exercise was the hands-on mushroom identification. We were all handed a clump of mushrooms and walked through how to identify the species using Mushroom Matchmaker. Using the program we successfully identified these a Woodlover Mushrooms. And they are POISONOUS. That is why you taste the mushroom and not eat it. Dr. Trudell assured us we would not die, but my tongue did tingle for about 30 minutes. Chef Norris made a really yummy Wild Mushroom Tart for us. Everyone really enjoyed it. The Gruyere was a little sharp for my taste, but overall it was really good. It's amazing how quickly these sorts of things can be put together by knowledgeable people. It took him about 20 minutes to prepare it (not including cooking). The rest of the weekend they had a special Mushroom Festival menu at the lodge. I learned that wild mushrooms taste really good with duck confit. Good to know for the next time I make duck confit. Out of the three guided events, I chose to go with Cliff. His emphasis was on finding edible mushrooms, not just study and identification. This turned out to be a good idea. 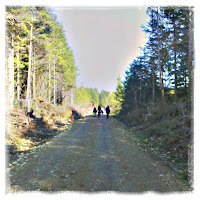 For, although Cliff was outright pessimistic about our chances of finding anything, we found lots. He knew that a smaller group is better and played down the situation. With a group of 15, we all found several mushrooms and some people got some real prizes! Although we went looking for Hedgehog mushrooms, we spent a good amount of time walking logging roads looking for Matsutake mushrooms. We collected eight different species of edible mushrooms in all. 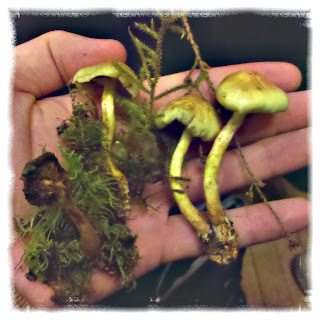 Each of us brought home at least 2 mushrooms, and some much more. Cliff showing the correct way to uproot a Matsutake mushroom. A rare Admirable Boletus. This was a beautiful mushroom. The top looked like powered chocolate. Roll out the pastry. Brush with egg. Mix ricotta, creme fraise and egg yolks. smear on pastry. Drizzle with balsamic if you want. 1. Notify your guests that they will be eating wild mushrooms. 3. Keep a sample to take to the emergency room...just in case. What fun! I want to go next year. Maybe I'll train Oliver to be a mushroom hunter!